I love Nutella. I love S’mores. What is better than taking these two amazing inventions and fusing them together?! Why have I never thought of this before?! 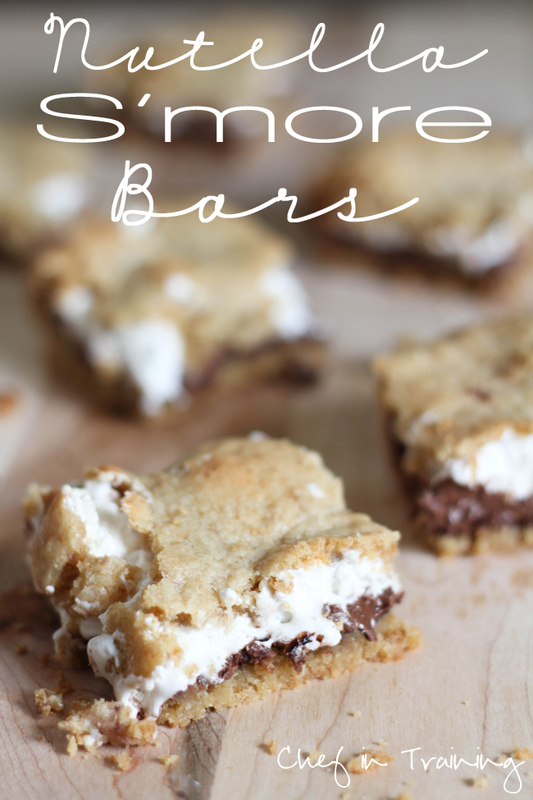 I saw these yummy S’more Cookie Bars from Lovin in the Oven, and thought to myself how tasty these would be if the chocolate was subbed out for creamy, delicious, Nutella! And trust me… these are INCREDIBLE with Nutella! These bars have it all… the softness, the goeyness, the flavor, easy, and my favorite part… they have nutella! You NEED to make these. Trust me, you want to! They will make everyone who eats them happy :) I know I sure was when I took a bite! Combines two of the greatest things on earth! This recipe is definitely one that needs to be made soon! Add in egg and vanilla extract and beat until well combined. Add flour, graham cracker crumbs, baking powder and salt and beat until well incorporated. Divide dough in half. Mash half of the dough into the bottom of a greased 8x8 pan. Spread Nutella over the top of the dough. Carefully spread marshmallow cream over top of the Nutella. Carefully spread remaining dough over the top of marshmallow creme. For me, it helped to press the dough flat in my hands, piece by piece, and lay it over the top, until entire top was covered. Bake at 350 degrees F for about 30 minutes or until lightly golden brown. Let it cool completely before cutting it up into squares. Nutella and marshmallow is so incredible together:-) Love how ooey gooey these bars are...yum!!! what is better than Nutella and smores? I have no idea! And yes, nothing gets better than combining two of my loves into one gooey bar. What a great and EASY recipe Nikki! The best of both worlds! Just pinned this one! Mmmm! Oh my goodness! You have combined my top two favorite treats: nutella and s'mores!! All I can say is........Thank you!!!!!!!!! These look delish! Thanks for sharing. Yum! Oh these look heavenly! I swear Nutella makes the world go around! Yum! I've never tried s'mores with Nutella before. Your's look amazing! This combination does sound delicious! Oh my, I'm starving now! Those look amazing! I just made these and have to say that my husband and I are in love with these bars! They are so easy to make and you get an incredible dessert! Yummyyy!!! I have been looking for something new, easy and interesting to make for our Wed. night suppers at church. These bars don't lool extremely thick, what size pan did you use and would a 1 inch deep large cookie baking pan work. In your opinion how many times would I need to times this recipe to make dessert for 50 people? Just made these, except I only had a clean 8 x 6. They ended up being very thick, so much so that it almost bubbled over the side. I would suggest leaving a little bit more for the graham topping since the marshmallow rises so much and breaks through. Overall, very easy to make and smells great!